Over the past few months there has been, with increasing frequency, the publication of many articles written on the emergence or re-emergence of the relational approach to complex business relationships. Whether it is a true renaissance or not, remains to be seen. After all, the importance of relationships in business, and for that matter, in everyday life is not a “new” concept. However, what is new, is that for the first time there is a means by which you can quantify and evaluate the effectiveness of your relationships. In today’s increasingly diverse marketplace, the complexity of doing business demands more than just a simple intent to collaborate. It requires both a commitment and a solid understanding of the changing dynamics in how government and industry do business, and the critical role that relationships play in achieving successful outcomes. To this end, and to address the complexities of public-public and public-private business arrangements, several collaborative models and corresponding frameworks have emerged over the past decade. The primary objective of these new models was to move beyond the transactional architecture and mindset that has limited collaboration effectiveness. While this demonstrated a recognition and intent to become relational, a clearly defined framework through which such relationships could actually be structured, implemented, and measured for effectiveness on an ongoing basis, was not available. ISO 44001, presents a real and meaningful opportunity for organizations to both contribute and share best practice methodologies in the areas of collaboration and relationship management. Originally established in 2013, the ISO/PC 286 Collaborative business relationship management framework, was proposed by the British Standards Institution in the United Kingdom – otherwise referred to as “BSI-UK” based on the success of the BS 11000 model in the UK and Europe. ISO 11000 which has been renamed to ISO 44001 was approved for publication on December 6, 2016. With an established and globally recognized standard such as the ISO 44001, a continuity of understanding and progressive insight will ultimately create a truer and more enduring framework that will serve as the standard for relationship management. The International Organization for Standardization (ISO) is an international organizations that was founded on February 23rd, 1947. Focused on promotion worldwide proprietary, industrial and commercial standards, ISO was one of the first organizations that was granted general consultative status by the United nations Economic and social Council. Needless to say, ISO certification carries a great deal of influence around the globe in terms of certifying that an organization’s management system, manufacturing process, service and documentation procedure meet all the requirements for standardization and quality assurance. In this context, the introduction of the ISO 44001 standard was inevitable. The reason is relatively straight forward; relationships and relationship management – especially when it comes to managing complex contracts, requires more than an enforcement of legal terms and conditions. It requires true collaboration and transparency between all stakeholders, which prior to the establishment of the ISO 44001 standard, were merely reflections of the desire to work together. Strategic Relationships Solutions Inc., in partnership with the Centre for Executive Leadership, Telfer School of Management, and the Institute for Collaborative Working (ICW) is pleased to offer a seminar on Relationships Management and Relational Contracting in Ottawa on May 23-25 and Toronto on June 14-16, 2017. Achieving sustainable performance on large-scale programs and projects requires that both existing and potential partners establish proactive, flexible, and collaborative relationships. An Executive seminar on Relationship Management, Relational Contracting, and Collaborative Working in Ottawa on October 24-26 at the KPMG Offices located at 150 Elgin Street. 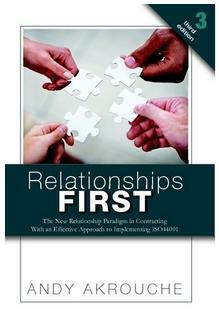 This Seminar will provide attendees with a systematic model for managing complex relationships. As they progress through the program, they will gain the knowledge and skills to effectively plan, source, establish and maintain relationships that will deliver exceptional performance. It will provide them with the tools to shift organizational mindset and to create a culture of collaboration and trust. We recommend this three-day training program for Public & Private Sector Executives, Relationship Managers, Service Delivery Managers, Vendor Relationship Managers, Procurement Managers, Business, and IT Managers, as well as Senior Project Managers involved in any significant Outsourcing, Public-Private Partnership or Shared Service. As I read the above excerpt from a recent newspaper article in which it was reported that costs related to the national shipbuilding procurement strategy (NSPS) had “ballooned” by the billions of dollars, it would be reasonable to wonder what happened? Was there a breakdown in communication, or a lack of understanding relating to what was and was not actually possible, that led to the project coming in at 181 percent over budget? Simply put, in formulating its “procurement strategy” through which partners such as Seaspan were engaged, were the government and its industry partners too eager to make a move in a particular direction? Did they make key decisions before they had a true handle on either the scope of the project, or its eventual cost? Once again, and coming in at 181 percent over expected budget, one could be excused for thinking that this was the case. To a certain degree – at least in relation to the last paragraph, this would be a fair conclusion. But does it bring us any closer to a real understanding of why it happened, and more importantly, how we can prevent it from happening again in the future? In this regard, I would like to refer to an Ottawa Citizen article by former ADM MAT Alan Williams. According to Williams, the government should scrap its plan – in fact the entire NSPS strategy, in favor of a return to the way things had been done in the past. Specifically, utilize DND personnel to write the statements of requirements that will achieve the needed balance between effectively describing the military’s needs while, enabling the private sector to bid a fixed or certain price. While Williams’ approach may at first glance, seem reasonable, there are some problematic gaps in terms of what he is recommending. To start – and this should come as no surprise to anyone who has read my blog or, attended my seminars, it is virtually impossible to reliably establish a set requirement without taking into account that both our needs and/or the product or service offering of the vendor will inevitably evolve over time. Think about what I am saying from the standpoint of an everyday situation. Many of you will likely remember when both Beta and VHS first came out. They were clearly different formats that were not interchangeable. This meant that when you chose one over the other, you were in reality locked in to that choice. However, and before making your final decision of which technology to buy, you likely did some research into the differences between the two, in an effort to determine which format would best suit your needs both now and in the future. In short, you made your decision based upon the best information that was available at that time. What happened to everyone who chose Beta? In choosing Beta, did you make a bad decision? Did you make a mistake? Perhaps you can take solace in the fact that even VHS was eventually replaced by newer and more advanced technology. The point is this; wouldn’t it have made sense to pursue a certain course of action today, while keeping your options open for the future relative to any unforeseen changes in the market? For example, what if you purchased your Beta system from the vendor, with the understanding that you could trade in the unit and exchange your library of movies at a future date, and do so at a preferred price? I realize that this is an overly simplistic example, but it does effectively illustrate my point regarding the problems with locking in both the buyer and vendor into a set course of action. Particularly when it involves complex technologies and long term contracts that can span years and even decades. Now I do not want you to misinterpret by position regarding the Williams suggestion as an indication that I am fully supportive of the NSPS approach. It clearly has its shortcomings. This being said, I do believe that the NSPS strategy has its strong points, and is therefore good for Canada. For example, it does facilitate government intervention with regard to creating a sustainable supply chain. The NSPS strategy also stimulates economic activity and opportunities, that would otherwise have been missed under the transactional model that Williams is proposing. What this means is that rather than trying to tighten specifications and hold vendor feet to the proverbial flame, we need to work towards creating a more consultative and collaborative engagement mechanism between government and private industry. Once again, this is something that is not possible under the ever elusive certainty model that Williams is proposing. While Williams and perhaps even the Central Agencies want us to think that they operate in a world of absolutes in which there is a high degree of certainty in costs and outcomes, nothing can be further from the truth. The fact is, there is no such thing as absolutes – especially when it comes to building new aircraft, new warships or for that matter any complex acquisitions for which either new supply chains must be established or, an economic activity created. Now at this point, some might be inclined to point to LCC analysis models as a solution to the problem. While there is no doubt that LCC analysis will enable management to understand the total cost of ownership, it is not a cost prediction tool. A more reasonable approach to addressing budget overruns is to accept the fact that with complex initiatives, absolutes do not exist until after the fact. It is the immutable 20-20 hindsight rule of the procurement world. Within this context, it would make far more sense to openly say that we do not know what the exact cost and benefit will be at this time however, it would be reasonable to establish a target of say $30 billion in cost, and $50 billion in potential benefits. As we progress further through the process we are, at set time intervals, committed to establishing a communication and reporting discipline involving all stakeholders. It is at these points of open engagement that we will be able to gain more certainty regarding costs as well as the related economic and industrial benefits. In short, the present information vacuum that exists between project announcement and the revelation of a 181 percent budget overrun will be eliminated, and with it the shock leading to a futile exercise in finger pointing, and what went wrong lamentations. What I am really talking about is managing a collaborative process as opposed to executing an adversarial transaction. If the government really wants to achieve a different outcome, then they have to move beyond the adversarial matrix of a transactional orientation in which the buyer’s role is limited to project monitoring and contract enforcement. This means that they will have to adopt a radically different yet undeniably proven mindset, that is based on a collaborative approach that drives ongoing alignment with project goals, and open communication. The real question this raises is whether or not TBS, PSPC, IC and Program owners are ready to become relational in their thinking and approach. A recent international conference brought together senior buying executives, vendors and lawyers from around the world, to discuss solutions to the high rate of initiative failures. According to one study, more than 70% of all business arrangements fail to deliver the expected results. What were the two key conclusions that came out of the conference in terms of reversing this trend? Building and managing strong relationships is essential to achieving desired outcomes for all stakeholders. I would personally like to extend to you and your colleagues, an invitation to attend my Fall seminar on November 25th and 26th, 2015 on Relational Contracting and Strategic Relationships Management. Establish the relationships & vendor management organization, and build its capacity to create a culture of collaboration and trust. Intra-Public Sector Relationships such as Shared Services arrangements, Program Owner-Provider relationships, Transfer Payments and Intra-Municipal Agreements.